North Korea says it will not recognise Japan as a member of six-nation nuclear disarmament talks due to resume in Beijing on Monday. The move follows Japan’s refusal to provide aid to North Korea under a disarmament-for-aid pact. Tokyo and Pyongyang are in dispute over North Korea’s kidnapping of Japanese citizens in the 1970s and 1980s. Correspondents say it is not yet clear how North Korea’s declaration will affect the meeting. 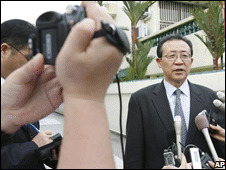 Mr Hill was due to arrive in the South Korean capital Seoul for consultations on Saturday, before flying on to Beijing. North Korea’s rejection of Japanese involvement in the talks came in a statement from the foreign ministry carried by the official Korean Central News Agency. You are currently browsing the archives for the disarmament-for-aid category.